Well, it's stainless steel. But it isn't just about rhyming. The Kenmore Elite 28093 mirrors the white Kenmore Elite 28092 and the black Kenmore Elite 28099 in all other respects. So, it's enormous, offers exciting storage options, a frost free operation, energy efficiency, advanced security capabilities, gorgeous design and a generous warranty. With the excellent company it keeps, it makes the bestsellers' list with ease. The Kenmore 28099 is really big. If you have a large family and a large house, you'll need lots of freezer space even if you already have a spacious refrigerator. With 20.6 cu. ft. of storage space, the Kenmore Elite 28093 is an excellent way to save time and money. By buying more, less often, you can look forward to spending the time and money saved on the activities that your family cherishes, like celebrating a milestone birthday or an anniversary. A bit of a tongue twister there, I know. Great if you love contrasts. But even if you don't but have a fitted kitchen, most of the black will be hidden in the cabinetry any way. If you prefer an all-black freezer, be sure to take a look at the Kenmore Elite 28099. Although the stainless steel Kenmore Elite 28093 costs a little more than the identical white and black freezers, it is well worth the money as the stainless steel finish lends an air of stylishness to your home. It's an especially good choice if white freezers just don't cut it for you. The Kenmore Elite 28099 offers interesting options to organize your food. That way, you don't have to pull your hair (and the shelves!) out trying to find the beef patty you froze a month ago. With its assortment of shelves, door bins and slide-out baskets, you'll probably be spoiled for choice when you opt for this 20.6 cu. ft. freezer. Its remarkable storage options include shelves, door bins and storage baskets. 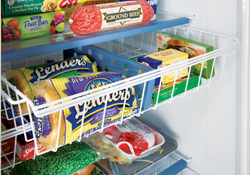 This Kenmore upright freezer offers 6 shelves. That's double what you will find on standard size freezer. And the shelves are quite wide, enabling you to safely store vast quantities of meat, veggies, ice cream or whatever. Wire shelves aren't just durable and outlast the plastic ones, they let light through, making it easier to find what you're looking for. The Kenmore Elite 28093 has 5 door bins. These bins are the place to keep party supplies well chilled until the guest arrive. The bins are adjustable so they are able to handle a surprisingly large assortment of snacks. And some of the shelves can be completely removed if you need to freeze unusually large items. The 3 slide-out baskets are the place to store tiny items that would be overshadowed by bulkier ones, making them difficult to find. And true to their name, they can be slid out of the freezer if you want to nail that elusive sausage you're sure you tossed in the basket last week. Then you're in luck. 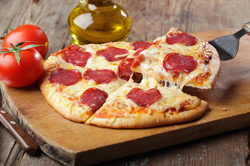 The Kenmore Elite 28093 comes with a pizza shelf. Just reach for the pizza shelf, sprinkle some shredded mozzarella to your heart's content, toss it in the oven, then enjoy hot. If you are not wild about pizza, you can still store round desserts on the shelf—ice cream cakes, perhaps? Or frozen yoghurt which, by the way, is packed with the goodness of probiotic cultures. Ever wondered how long your meat or veggies will take to freeze rock solid? Of course, the quicker your food freezes, the more juices, flavor and color you lock in. So if this is an important criterion for you, take heart. The guys at Kenmore were thoughtful enough to include the quick freeze function on the Kenmore Elite 28093. At the touch of a button, the preservation process is sped up by dropping the freezer temperature rapidly. This is because this Kenmore upright freezer model is frost free. And if you are not inclined to go through the paces of manually defrosting your freezer (emptying the freezer and tilting it, bending, chipping at the ice, then mopping up the mess), the Kenmore 28093 may be the right freezer for you. This is because it consumes at least 10% less energy than identically sized, frost free models. The practicalities of this? Lower energy bills, amounting to hundreds of dollars in savings over the life of the freezer. So because this model consumes only 691 kWh of electricity each year, you can expect it to cost you $74.00 to run each year or just $6.17 each month. Cleaner air for you to breathe. Less energy is needed to power America, resulting in less pollution. You don't even need to get into the divisive climate change debate here. The Kenmore Elite 28093's lock and keys are a great child safety device. Use them to stop your little kids or grandchildren from turning the freezer interior into a playground, to their detriment. The freezer's lock and keys are also an economical way to keep thieves from getting their hands onto your precious food. And because the lock is factory attached, you don't have to save up to buy a separate lock that—as most afterthoughts do—looks a little awkward. This 20.6 cu. ft. Kenmore Elite 28093 upright freezer is part of the exclusive Kenmore Elite range. So it comes with a fitting range of additional benefits. An alarm sounds and flashes to alert you to take corrective measures to prevent food spoilage when the freezer malfunctions and stops cooling, when there is a power failure or when the door is accidentally left open. All the main functions such as temperature setting and adjusting, setting alarm thresholds and quick-freeze are digitally controlled. So you can apprise yourself of the status of these by simply glancing at the LCD panel. To cap it all, this Kenmore Elite freezer has a durable feel to it. So it will likely give you years and years of reliable service. Like other Kenmore upright freezers, this Kenmore Elite 28093 comes with an elaborate one year warranty. In essence, in it, Kenmore undertakes to remedy, at their cost, defective parts and poor workmanship that existed at the time of purchase. Just be sure to retain your receipt and to not use the freezer in a commercial setting as this will void the warranty. Do You Have a Penchant for the Tried and True? At $1,159.99, the regular price of the Kenmore Elite 28093 crosses the psychological $1,000 level. Well, it offers 20.6 cu. ft. of freezer space. That is the largest in the entire Kenmore upright freezer range. So you can look forward to buying up a storm. And saving time and money while at it. But that's not all. It's durable, stainless steel, offers impressive storage options, is frost free, energy efficient and comes with an industry standard one year warranty. And, hundreds of happy buyers are raving about it. How many other upright freezers lay claim to this raft of accolades?